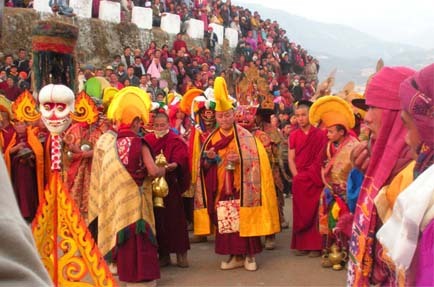 Torgya Festival is a monastic festival which was celebrated by the Monpa tribe at the Tawang Monastery in the Tawang district of Arunachal Pradesh. This festival held every year for three days starting from 28th day of the eleventh month of the lunar calendar, which generally falls in the last part of January. In order to drive off evil forces and to ward off any natural calamity. Monastic dances were performed for 3 days during Torgya festivals. In the State of Arunachal Pradesh, the three days long Torgya Festival began with recitation of religious texts and Monastic dances in the premises of Tawang Gonpa. Torgya Festival was a three day festival which signifing the destruction of evil spirits and harmful forces. It seeks to promote prosperity and happiness amongst the people. This festival was believed to be celebrated to chase out the evil spirits and usher prosperity and happiness for people and crops. The Torgya Festival was carried out of the monastery in a procession of Lamas who dressed in warrior outfit and chanted war slogan. It was burnt outside the boundary wall of the monastery towards southern gate with full religious rites. This symbolizes destroying of all evil and destructive forces inflicting all living beings. The Torgya Festival was placed before the deities in the main prayer hall of the monastery where the reverent Lamas performed religious rituals and also recited several religious texts. The monks were dressed in colorful costumes and magnificent mask of deities and animals were presented various monastic dances of specific meaning and significance at the courtyard of monastery on the occasion. The abbot of the monastery will bestow Wang (blessings) to everyone present by touching their head and sprinkling holy water. The blessed Manribs pills and Rhungmas (sacred thread) shall also be distributed to all. The recitation of religious texts and monastic dance will continue up to the third and final day of the festival. This Monastic festival was celebrated at Tawang Monastery every year on the eleventh month of lunar calendar to expel evil forces and bring peace and prosperity to all living beings. During the festival a ritual monastic dances in magnificent traditional attires were performed in cham-lang the courtyard of the Tawang Monastery. A propitiation (Torgya) rite of Yamactaka Chak Khar Zur Gurpa is conducted and with this connotation the festival is called “Torgya”. Thousands of people throng the monastery during these three days in their best dresses, making the festival a carnival of colours.The core event of the festival was Chham, a highly choreographed sacred dance lasting for three days. A select group of monks were dressed in magnificent robes and wearing masks representing various divinities and earthly characters perform Chham in the courtyard of Tawang monastery to the accompaniment of beating drum and cymbals, blowing of huge telescopic horns and clarinets. The final day of the festival, a vase initiation was bestowed by the Abbot of the monastery to the people and after making offering and ablution rituals in the presence of Maitreya Buddha, the image was taken for a procession on the circumambulation path, while at the same time the giant sized brocade Thangka was displayed for public viewing. Every third year this festival was celebrated on a grander scale and it was called “Dung-gyur”. During Dung-gyur the monks conduct “Mani Dum Drub” ritual (10 Millions of Mani Mantra recitation). Click here for 2018 Fixed Departure Torgya Festival Photography Tour and Torgya Festival Tour. We also craft and organize custom made tour, as per your interest and budget. For custom made Torgya Festival Photography Tour, please feel free to contact us.